Use dedicated software to create branded and legally compliant email signatures for all emails sent through Microsoft Office 365. 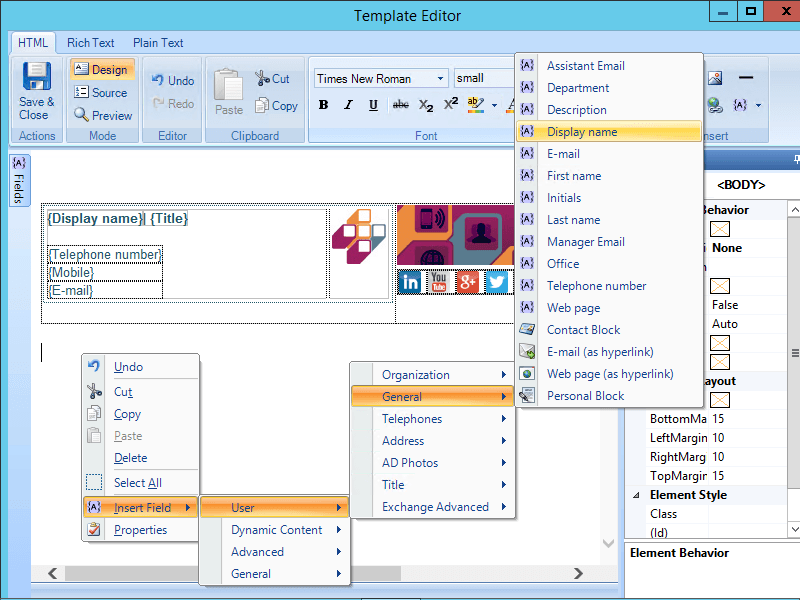 Exclaimer Signature Manager Office 365 Edition lets an organization centrally design and distribute email signatures to all staff members using Office 365. Distribute organizational Office 365 email signatures with ease. Let users see their email signature in Office 365 as they compose their message. Give different email signatures to different departments depending on their job function within the organization. Automatically pull user data from Office 365 Directory. Create multiple email signatures so users can select the most appropriate one for their messages from the Office 365 drop-down menu. Update all Office 365 email signatures from one central console, providing ultimate control. Design multiple signatures with dynamic content such as promotional banners, social media links, marketing artwork, compliant legal disclaimers and more. It really makes an impact. Give your users the most consistent, professional and legally compliant email available for all Office 365 emails. No requirement for an Exchange server and get all users’ details via your organization’s Office 365 Directory. 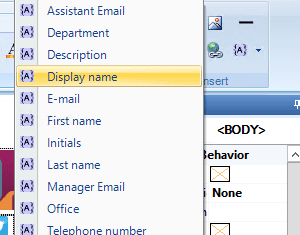 Avoid empty lines in email signatures when directory fields are missing. Create an email signature template using the powerful HTML template editor, which is amazingly simple to manage. With a single click, update all Office 365 users’ email signatures with autocompleted contact details. All features work immediately upon installation without the need for any additional configurations or modifications. 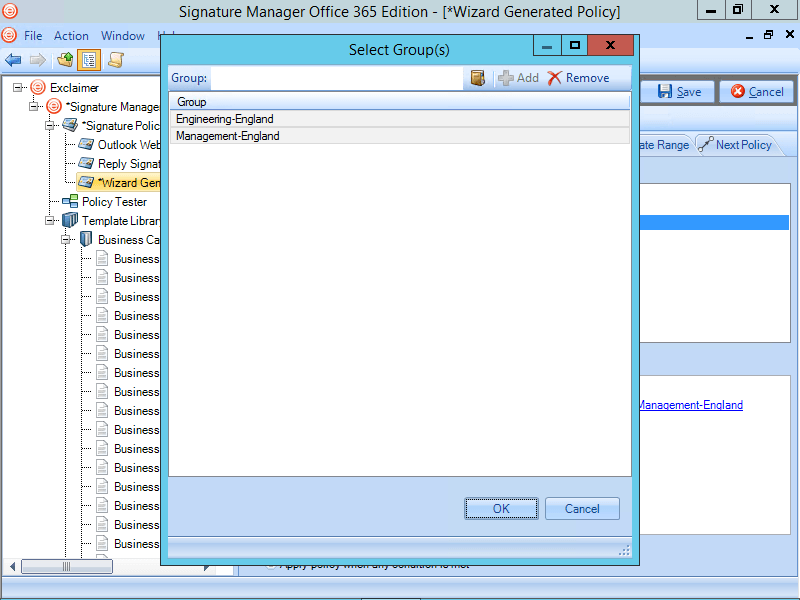 Create specific Office 365 policies to showcase what elements are to appear in an email signature. 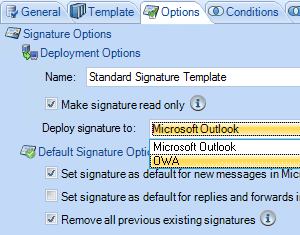 Once combined with a signature template, all Office 365 users get the same email signature. 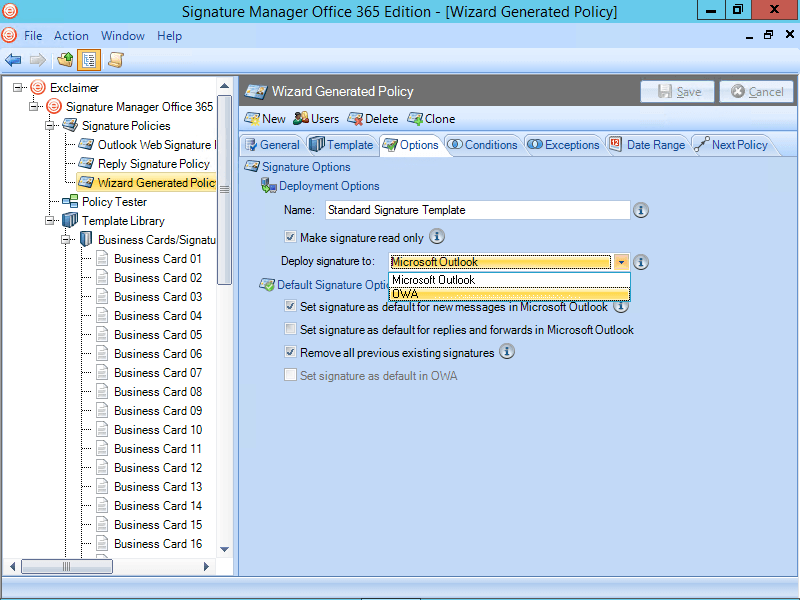 Test all policies work correctly in the software’s Policy Tester before deploying the new email signature to all Office 365 users. Coordinate marketing campaigns through email signatures with promotional banners that can be set up to be automatically removed/amended when needed. 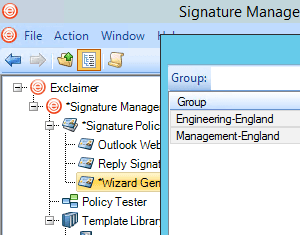 Sophisticated rules engine technology allows for the assignment of different email signatures depending on job role/department by using Office 365 Directory groups, OU and other attributes. Let users edit their contact details where applicable, while you maintain control of all email signatures' font characteristics. Create email signatures with a simple design for internal users and detailed ones with full contact details when sending to an external recipient. Use data for the dynamic email signature fields taken from the message body, user’s contact details and recipient. Create numerous email signature templates for different purposes. Add static text, corporate imagery and dynamic content to showcase your organization. Use the in-built WYSIWYG editor to create bespoke email signature designs or use the extensive template library included. Announce important events, special promotions and other company news by using the email signature channel for marketing purposes. Showcase your brand using a low-cost, high-value marketing communication tool. Increase customer loyalty and build social media followers with a ‘social media strip’, complete with interactive social icons for all email signatures. Let your customers know you are the best in your field by using email signatures to highlight industry award wins and corporate certifications. Contact/talk to us today to learn more about Signature Manager for Office 365 Edition. New product available for your Office 365 signatures! Click below to see a detailed feature comparison for both Office 365 signature solutions and find out which one meets your individual business requirements. Try our cloud-based Office 365 service instead. There’s nothing to install and you'll get email signatures on all devices, including mobile devices and Macs.